Daffodils (Narcissus spp.) bloom in late winter and early spring, dotting landscapes with patches of sunny brilliance. Depending on variety, these long-lived perennial bulbs may be hardy from U.S. Department of Agriculture plant hardiness zones 3 through 11. Planted in formal garden borders or meandering through open woodlands, daffodils ask little more than plentiful sun and good drainage. In exchange, they deliver years of reliable springtime blooms. Most daffodils require fall planting to produce blooms the following spring. Once soil temperatures cool to 60 degrees Fahrenheit, daffodils can go in the ground. This normally occurs about six to eight weeks before the ground freezes in your area. Cool temperatures discourage above-ground growth, but allow roots to establish before winter. Daffodils enjoy full, direct sun and well-drained soil, rich with organic matter. 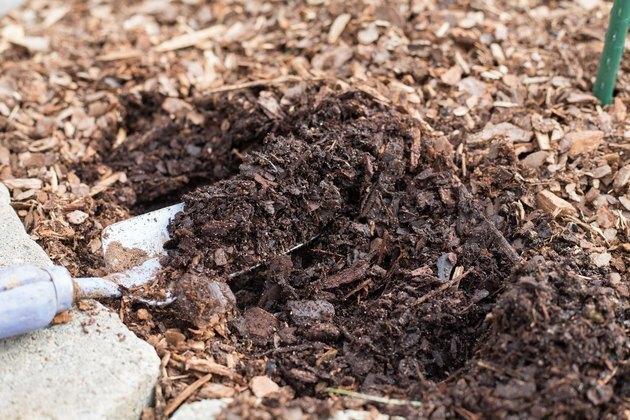 Layer 2 to 4 inches of organic compost in a sunny garden location, and then work it down into the soil's top 12 inches. Everything a healthy bulb needs for its first season is stored up inside. No additional fertilizers are needed at planting time. When choosing daffodils for planting, keep recommended growing zones in mind. Most daffodils need winter chilling to set their spring blooms. Fall planting provides this cold treatment naturally when daffodils are planted in appropriate zones. 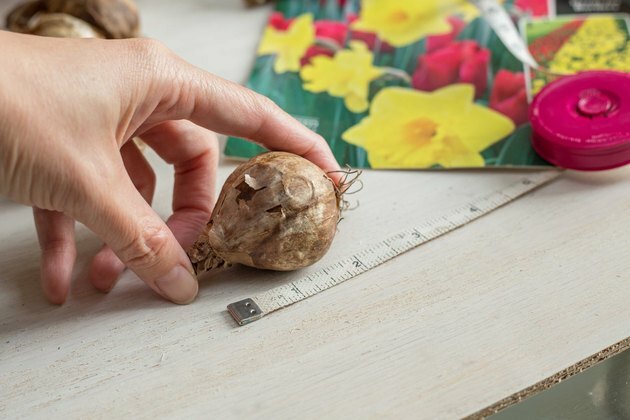 Always choose large, firm, damage-free bulbs for the best results. Balance early-blooming varieties with midseason and late-season bloomers to stagger flowering times and prolong your spring daffodil display. Warm-climate winters lack sufficient cold for most daffodil varieties. Avoid disappointment by choosing warm-climate varieties that don't require winter chilling, or plant pre-chilled daffodil bulbs each year. The depth of daffodil planting holes depends on the size of the bulbs themselves. Plant bulbs three times as deep as their height. For example, a 2-inch-tall bulb should be planted -- pointy end up -- in a 6-inch-deep hole with 4 inches of soil above it. Dig individual holes or dig a large area at once. Space daffodil bulbs approximately three times the bulb's width apart or 4 to 6 inches between bulbs. 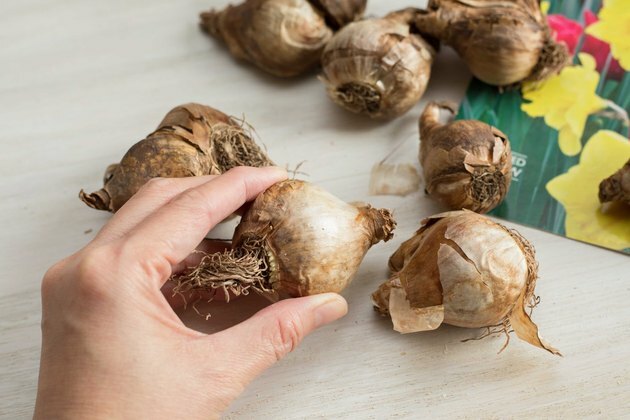 Cover the bulbs with soil and press gently. For a natural look in lawns or woodlands, plant in waves that mimic naturalized daffodils, or toss a handful of bulbs in the air and plant them where they land. Water daffodil bulbs at least once after planting, but do it lightly. Never leave bulbs with soggy soil. In most regions, fall and winter precipitation provide all the moisture needed until spring. 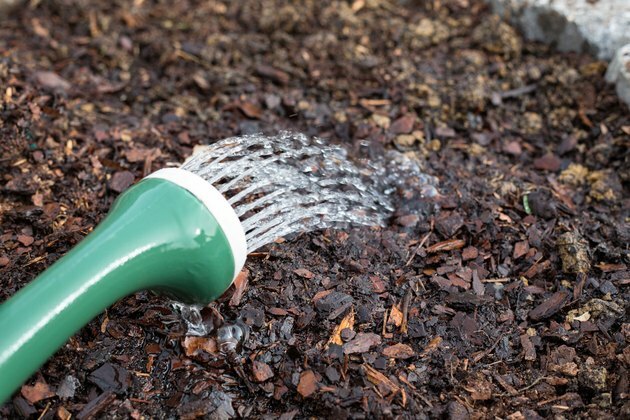 Mulch the area with a 2- to 3-inch layer of organic mulch to regulate soil temperatures and retain moisture. Pine needles, chopped pine bark or organic compost work well. Deer and rodents bypass daffodils, so no extra protection from marauders is needed. 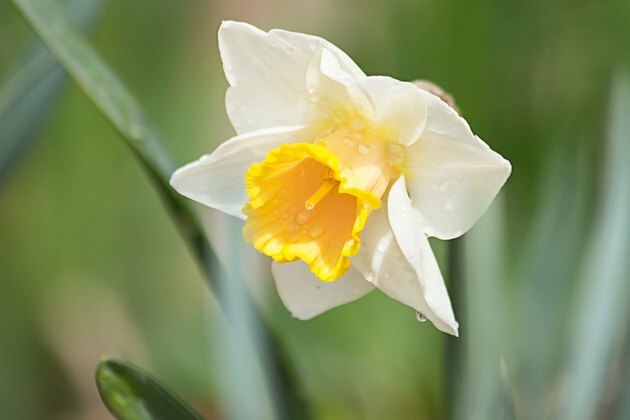 When spring arrives, supplement rainfall so daffodils receive 1/2 inch of weekly water during active growth. A 2- to 3-inch layer of spring compost provides nutrients for future years.